MISSION STATEMENT: Heal Inc cannot heal anyone. Only you have that power. We are dedicated to the long-term health and wellbeing of all life on earth by helping to empower people to heal themselves. We encourage everyone to take responsibility for their lives and offer tools and educational material for their life journey. Try our FREE 30 minute session today! Strengthen and stretch your muscles effortlessly on our portable 10 minute gym machine. Relax and feel the healing benefits of our no sweat FAR Infrared Sauna. Enjoy a relaxing foot and back massage in our luxurious massage chairs. Heal Inc has a volunteer program which helps members of the community dedicate their time and skills to helping our members to have the best possible experience while at our spa. The minimum commitment is only 6 hours per week. Volunteers that are accepted into the program will enjoy the health benefits of a FREE membership and 20% discount on products. They will also receive some FREE 10 day passes for friends or family. For more information or to apply, please private message us or call anytime! Ron has been involved within the Health Industry as a researcher, adviser, product developer and successful entrepreneur. He has been a guest speaker at many events, interviewed on many daytime television programs and has been instrumental in developing health institutions across North America. After working at a multidisciplinary business, and exploring varying health courses in college, Christiane realized she wanted to help people on their healing journey. She graduated from the Registered Massage Therapy course at College Boreal and worked at a large spa. Through subsequent studies, she became a Reiki Practitioner and a Certified Emotion Detox Coach. Founder and Survivor of Secrets "Protect Our Children, Stop Sexual Abuse", mother of two beautiful young adults, volunteer and I work different jobs in many different fields. Heal is my sanctuary. A place I go to recharge my soul, so that I can help others. I love my Heal family. I am grateful! Chris was one of our very first volunteers. Chris joined Heal over 4 years ago at the Rainbow Center location. He would hand out flyers in the mall and try to get people to try the Heal Spa for free. Since joining Heal, Chris has lost over 100 lbs and is now helping to run the new location in New Sudbury. Kindhearted individual who loves serving others and who enjoys all living beings. A language graduate of Laurentian University, Cher enjoys an holistic lifestyle and is a certified yoga teacher. An avid outdoor enthusiast, she enjoys kayaking and paddle boarding in the summer and snowshoeing in the winter months. Trail and mountain hiking are a huge passion year-round, and Cher believes there is no problem so formidable that you can't walk away from it. If you love life, life will love you back. Happy trails! Very hard worker, but knows when to relax and get his meditation on. He has been working in the computer industry for over 20 years and is still learning new lessons in life and business. Every day is a learning day. An active granny who is chasing dreams when not chasing her grandson. A fun loving, red-headed, freckled lady who laughs at her own jokes. She is not only a friend of the family but has been a member of Heal since its conception. Deb brings with her a lifetime of health knowledge and transitioned to a Whole Food Plant Based diet over 3 years ago. Her respect for nature and wildlife make her the perfect volunteer for Heal. If anyone knows how to source the best local organic produce, it’s Deb..! Happy go lucky, loving hippy. Positive, happy person who loves people.. and especially dogs! Everyone from the elderly, baby boomers, business people and students are looking for new alternative avenues for their health and well being. Gyms seem very popular yet the typical gym experience is not always appealing or appropriate for all populations. Heal offers a fresh new approach for those who have little time, but want to see and feel results. Compared to gyms which can be loud, intimidating, expensive and uncomfortable, Heal offers a personal pampering experience with a more gentle, passive approach to exercise and pain relief. Memberships are very inexpensive ranging from $2.60 to $4.60 per visit. After experiencing their first free session, most people purchase a membership package. This is great value for a 30 minute circuit which includes free oxygen infused, lemon spring water and tea. This short amount of time required for this spa/gym experience suits our clientele who try to fit this into their busy schedule. Heal Spa welcomes everyone 16 years of age and older. 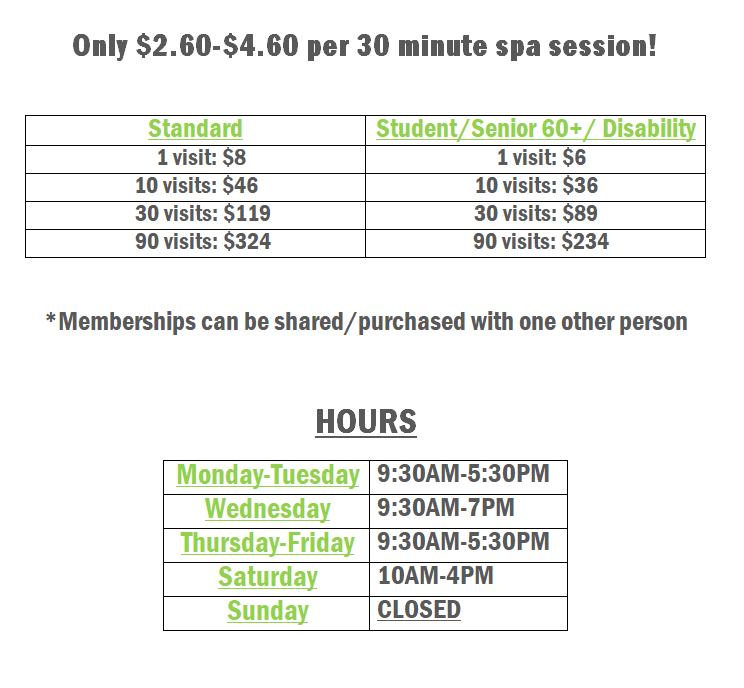 We offer discounts for students, seniors 60+ and those with disabilities. What our members are saying: "I have Peripheral Neuropathy with burning pain in my feet and lower legs. After only three 30 minute sessions at Heal, the burning pain has decreased substantially." What our members are saying: "I had Cancer last year and I've heard a lot of great things about Infrared Saunas, Chaga Tea and Rebounding(the vibration machine) from well respected Cancer Research Doctors from around the globe. I have made the Heal Circuit part of my recovery and I have noticed how well I feel. I TRUELY believe that it is helping me. It's been over a year since my diagnosis and there is NO longer any signs of the disease. I am 100% healthy again." Looking for positive health changes in your life? "I attend Heal for a peaceful and healthy experience. I now eat better, am in a better mood and feel positive changes. I can't see my week go by without coming to Heal..! Depression & Anxiety "I have been coming to 'Heal Sudbury' for approx 7 months. I feel that it has helped me greatly since I have been dealing with depression and anxiety for many years. When I am at Heal doing the 30 minute circuit, I am relaxed and my anxiety level lowers quickly. I look forward to coming to do the circuit 4-5 times per week. It is a very relaxing environment. What our members are saying: "I am a certified Physio Assistant and Occupational Therapy Assistant. Heal Inc is the one place that I would recommend to anyone looking to reduce stress, get healthier, lose weight, tone muscles and perhaps even live longer! Every step of the Heal Circuit promotes blood circulation which delivers oxygen to every tissue and organ in the body. This promotes quicker healing, strengthens the immune system and decreases the odds of illness. Their Whole Body Vibration and infrared technologies are currently used by many Physiotherapists. I am thrilled to have been introduced to Heal Inc and I am telling everyone I know about this wonderful place." Doctor is impressed..! "I have been coming to Heal for a few months and it always brings me pain relief as well as stress relief. A calming atmosphere, pleasant-friendly and relaxed staff who endeavor to make you feel comfortable and who never try to sell you products. Great therapy circuit that is quick, efficient and is the perfect marriage of body and mind therapy. I walk in with pain and 30 minutes later I walk out feeling normal. I love 'Heal' so much that I tell everyone I meet. I also love that this place is affordable, even on low income. Even my doctor is impressed with my results from this amazing place! Thank you Heal..! " Take the first step towards healing and contact us for more information.